The San Diego Archaeological Center is a curation facility and museum where visitors can learn the story of how people have lived in San Diego County for the past 10,000 years. Visit our museum, which is located in the picturesque San Pasqual Valley in Escondido, one mile east of the San Diego Safari Park. In addition to its role as a museum, the Center serves as an education and research facility and is the only local organization dedicated to the collection, study, curation and exhibition of San Diego County’s archaeological artifacts. Promote understanding of San Diego County’s rich cultural history and the science of archaeology through curation of archaeological collections, facilitation of collections-based research, cultural collaboration, and dissemination of research results to the scholarly and general public. 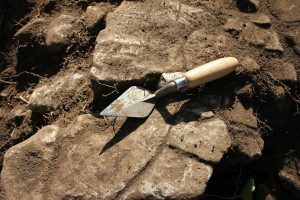 To have the resources necessary to provide collections-based research opportunities to academic and professional archaeologists, historians, cultural specialists, and other qualified individuals. To offer opportunities for high-school and college-level students to conduct supervised research. The research-related goals of the San Diego Archaeological Center’s Collections & Research Department are to (1) facilitate and initiate research on the Center’s collections or related materials, and (2) disseminate research results to the public. Research and scholarship is inextricably linked to the Center’s core functions of curation and public interpretation. Research helps to realize the knowledge inherent in and associated with the Center’s collections. This knowledge has relevance to both local and global questions. Research is fundamental to advancing and improving the Center’s public programming. Members of local communities are stakeholders in research activities. Their perspectives will be considered in research planning, conduct, and the dissemination of results. Internal structures and systems for facilitating research must be established for high quality research to prosper. These systems must provide for approval and monitoring of access, methods, progress, and outputs. New public concerns, such as climate change and human-environment interactions, and new techniques, such as sensitive chemical characterization, have brought new meanings and new analytical possibilities to collections. Such research will be promoted when deemed appropriate to the subject material. Partnerships with other scholars and research and educational institutions and agencies are essential to high-quality research. Formal partnerships will be investigated and created when deemed appropriate. Communicating research is vital. Outputs will be disseminated widely and in a variety of media and formats designed to engage diverse and multi-level audiences.